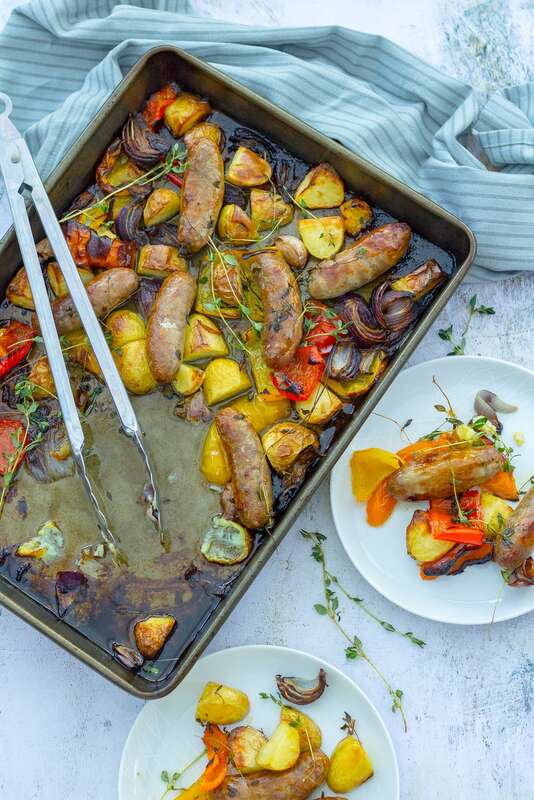 Quick, delicious and family friendly this Easy Sausage Traybake is the perfect midweek meal. Throw everything into one tray and cook for 45 minutes – what could be simpler? 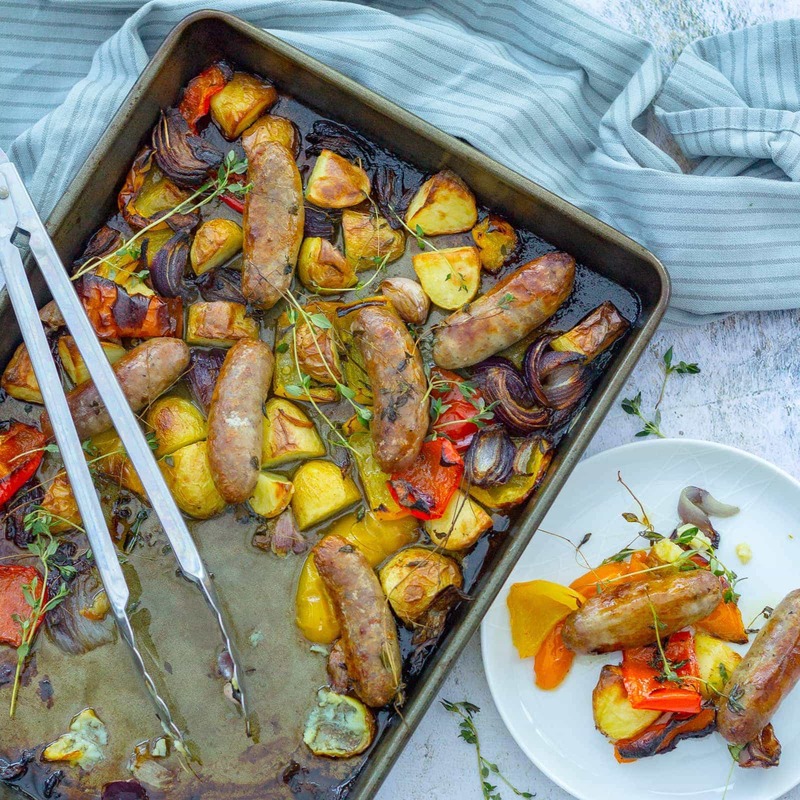 This Easy Sausage Traybake is one of those ‘I can’t believe it’s not on the blog’ recipes. It’s a real Gargano family favourite, not least because it is seriously low effort!! 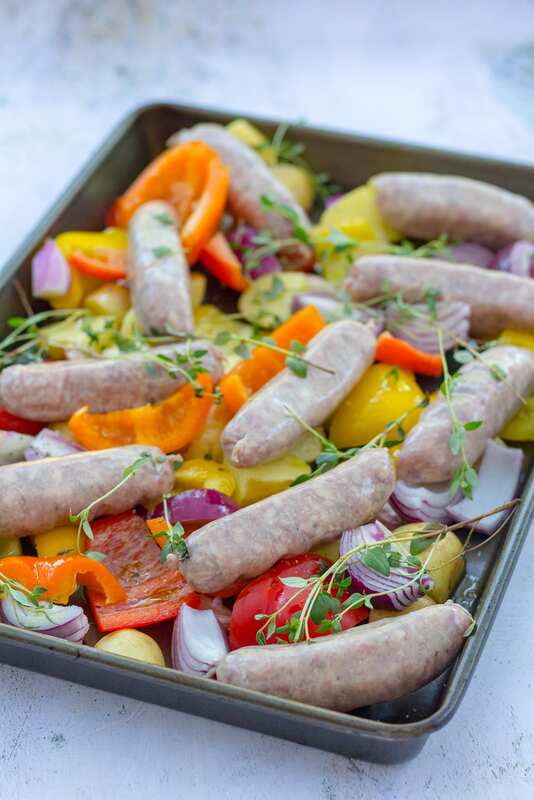 Simply throw sausages, new potatoes, peppers and onions into a large oven tray / roasting tin, add a little salt and pepper, some herbs, garlic and a splash of oil. Then pop it all in the oven to do its thing for 45 minutes. The result? 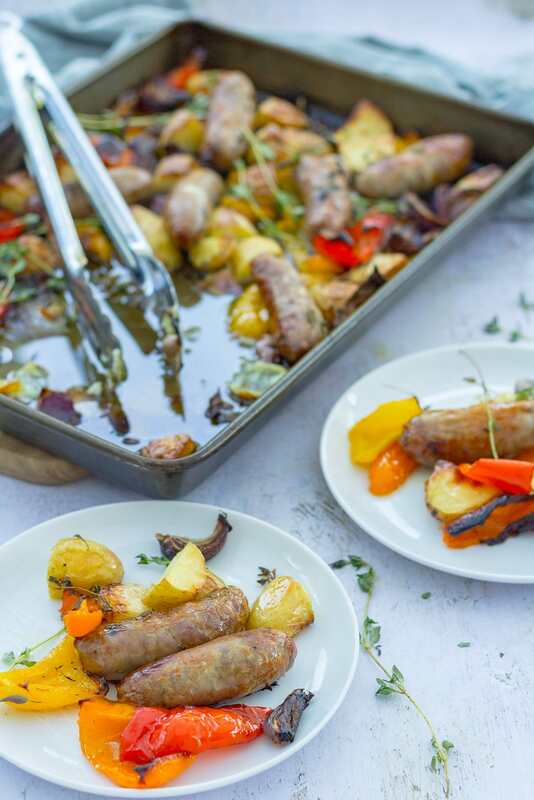 Deliciously cooked sausages (soooo much better than fried or grilled), crispy new potatoes, sweet roasted peppers and onions and a very happy family – this is one of those meals I KNOW the kids will eat without complaint. It’s also the perfect meal for cooking when I know Mr G is going to be late back. I simply put his portion (cooked) in an oven proof bowl, then he pops it in the oven for 15-20 minutes to reheat when he gets back – happy hubby! And the same logic can be applied to leftovers (if you have any). 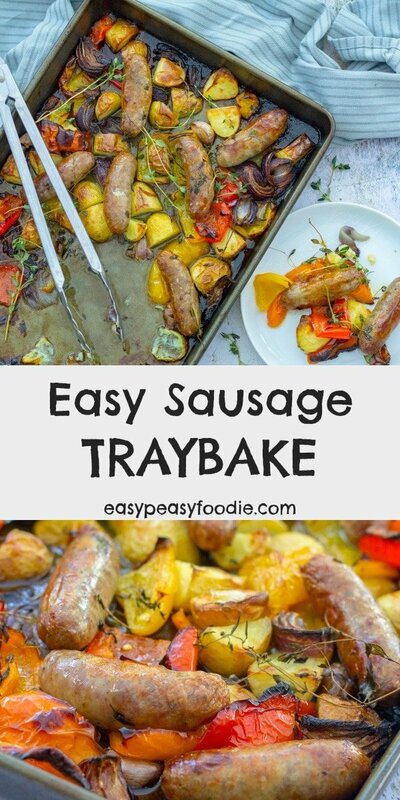 I often make extra of this Easy Sausage Traybake so I can have it for my lunch the next day. It’s like having a homemade ready meal! This recipe is actually an adaptation of Mary Berry’s Roasted Sausage Supper, but I’ve been cooking it for so long it’s been adapted many times, so apart from the basic ingredients it bears little resemblance to her original recipe. This Easy Sausage Traybake is also the recipe which began my love affair with traybakes (in case you are new round here, I am obsessed with traybakes as being one of the easiest, quickest and most delicious ways to cook), which makes it all the more ridiculous that I haven’t yet shared it with you all! Still, I have now 😀 Hope you enjoy it as much as we do!! 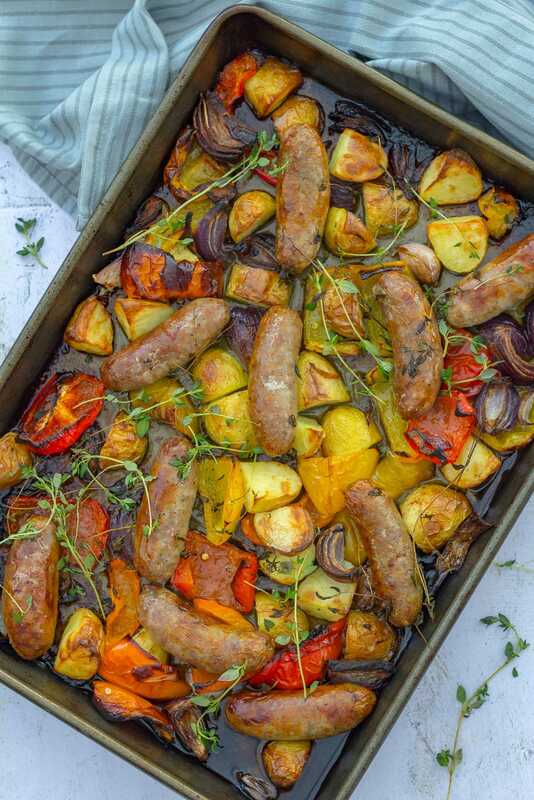 Wine -wise, this Easy Sausage Traybake goes brilliantly with gutsy Southern French reds, young riojas and other similar wines. If you prefer white, this goes surprisingly well with Sauvignon Blanc. Place all the ingredients (except the chicken stock) in a large oven tray or roasting tin. Use your hands (or two large spoons) to turn everything in the oil, so it is well coated. Rearrange everything on the tray in one layer. Place the tray in the oven for 25 minutes. After 25 minutes remove the tray from the oven, turn the sausages and pour over the chicken stock. Return to the oven for a further 20 minutes, or until everything is done to your liking (45 minutes total cooking time). It’s really important the ingredients are well spread out in the tray. If you don’t own a large baking tray, use two smaller ones. If you do use two trays, increase the amount of chicken stock to 400ml. To reheat, place leftovers in an ovenproof bowl, in an oven preheated to 180C / 160C fan/ gas mark 4 / 350F. Cook for 15-20 minutes, or until the sausages are piping hot all the way through. Not suitable for freezing (except the cooked sausages on their own ARE suitable for freezing). 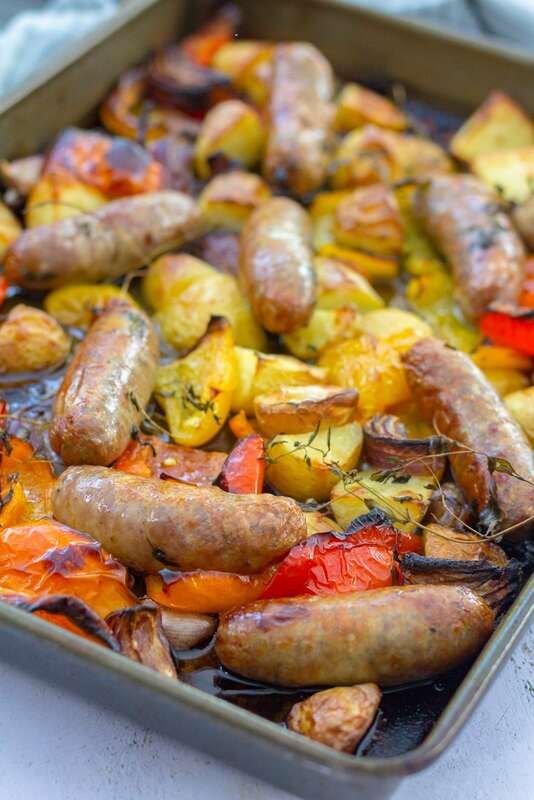 I think a sausage traybake is such a great midweek meal. I’ve got a recipe that I often make and it always goes down well, although the kids tend to mainly eat the sausages and leave the vegetables! Thanks for sharing with #CookOnceEatTwice! Oh, goodness…sausage and this array of vegetables are so delicious! How brilliant to cook it all on a tray. I can’t believe I haven’t tried this! YUM. Fairly basic and quite easy. However, the potatoes sadly cannot hope to get crispy.